Assam Chief Minister Sarbananda Sonowal and Union Minister for Health & Family Welfare JP Nadda jointly lighting a ceremonial lamp to mark the inauguration of 5th National Summit on Good and Replicable Practices and Innovations in Public Healthcare Systems at Kaziranga in Golaghat district on October 30, 2018. Union Health Minister JP Nadda on Tuesday stressed on the need to adopt modern innovations like telemedicine for delivering quality health services to reach the areas. 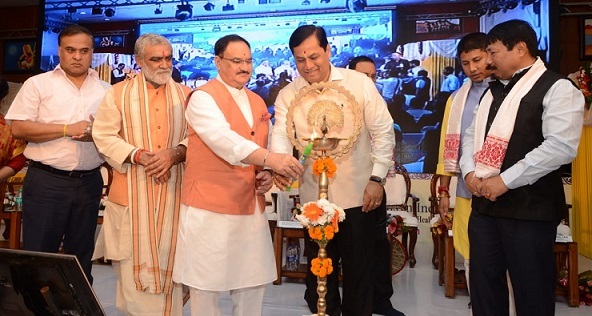 Nadda said this while delivering a speech at the inaugural session of the 5th National Summit on Good and Replicable Practices and Innovations in Public Healthcare Systems, which began at Kaziranga in Golaghat district on Tuesday. Union Health Minister Nadda also said that the Central Government following the Prime Minister Narendra Modi’s ideal of ‘perform, reform and transform’, has been making all out efforts to bring holistic changes in the health system. The Union Minister also called for more use of information technology in public healthcare management system in the country for successful implementation of Tuberculosis interventions and Ayushman Bharat – Pradhan Mantri Jan Aarogya Yojana. The Union Minister, who presided over the inaugural session, moreover urged the health functionaries to make frequent field visits to ensure better execution of government health schemes at grass-root level. Speaking on the occasion, Chief Minister Sarbananda Sonowal said that health is priority sector for the State Government and it has worked to replicate best practices to unleash better healthcare facilities to the people with special focus on the marginalized section. The inaugural session was also graced by State Health Minister Himanta Biswa Sarma and other Union and State Ministers. Welcoming the delegates to the National Summit, Chief Minister Sonowal said that Assam and northeastern States received special focus from Union Government under the leadership of Prime Minister Narendra Modi and this provided lots of encouragement to the states to achieve the development goals at a faster pace. “The State Government accords top priority to health sector and adopted a number of steps to provide better healthcare facilities to the people. We have given special focus to the marginalized class so that they could afford quality healthcare services and made significant achievement in this regard. The Central Government’s support gives an emphatic boost to our initiatives,” he said. Stating that the three-day summit would enable the delegates to learn the best practices being adopted in different parts of the country, the Chief Minister remarked that the experience would be highly beneficial for them. State Health Minister Himanta Biswa Sarma in his speech said that due to sustained efforts of the health department in the State, remarkable progress has been made in healthcare delivery system in Assam. He said that MMR, which was 480 in 2006 came down to 236 in 2018 as a result of successful interventions made in the state over the years. Underlining the need to reach the unreached areas in a more vigorous way, the Health Minister apprised about the initiatives of the State Government to set up 19 Cancer Care Hospitals in partnership with TATA Trusts, free health insurance scheme Atal Amrit Yojana with financial coverage of Rs. 2 lakh, Wage Compensation Scheme for Pregnant Women of Tea Garden Areas providing Rs. 12,000, free cleft lip operation etc., which have been able to bring positive changes to the healthcare system in the State. Union Minister of State for Health & Family Welfare Ashwini Kumar Chaubey, Agriculture Minister Atul Bora, Water Resources Minister Keshav Mahanta, Minister of State for Health Pijush Hazarika, Secretary, Ministry of Health & Family Welfare Preeti Sudan, Additional Secretary & Mission Director (NHM), Ministry of Health & Family Welfare Manoj Jhalani and senior officials of Central and State Governments were also present in the inaugural programme.